Professor Richard Betts made a guest post on the blog “And Then There’s Physics” (ATTP) on how we should “label the behaviour, not the person”, in relation to global warming denialism or contrarianism, and in particular labels applied to people, such as “denier”. He proposes that we should de-polarize the ‘debate’ around Anthropogenic Global Warming (AGW), and specifically, avoid using the term ‘denier’. Of course, it takes all sides to ‘de-polarize’ but in any conflict, it is good to take the initiative. He further points out that this goes beyond the negative language traded between those with opposed positions, because often those of moderate temperament, but with a lot of insight and knowledge (e.g. the climate scientists who are colleagues of Richard Betts) are it seems put off from engaging in the blogosphere, due to the atmosphere that has been created, in this increasingly polarized medium. I was thinking of contributing to the over 300 comments to this blog post, but decided that my best response was a blog post of my own, because I support Professor Betts basic premise, and wanted to go further: to question if polarization was leading to something worse – missing the target! I envisage a simple matrix to characterize the spectrum of opinions on AGW. In one dimension (vertical), we have the point of view, from the “Pro” (AGW) and “Anti” and the much greater population of those or are undecided (no, I cannot say this is backed up by a specific opinion survey, but is broadly reflected in samples of opinion, and polls – but the areas are not accurate, merely indicative). 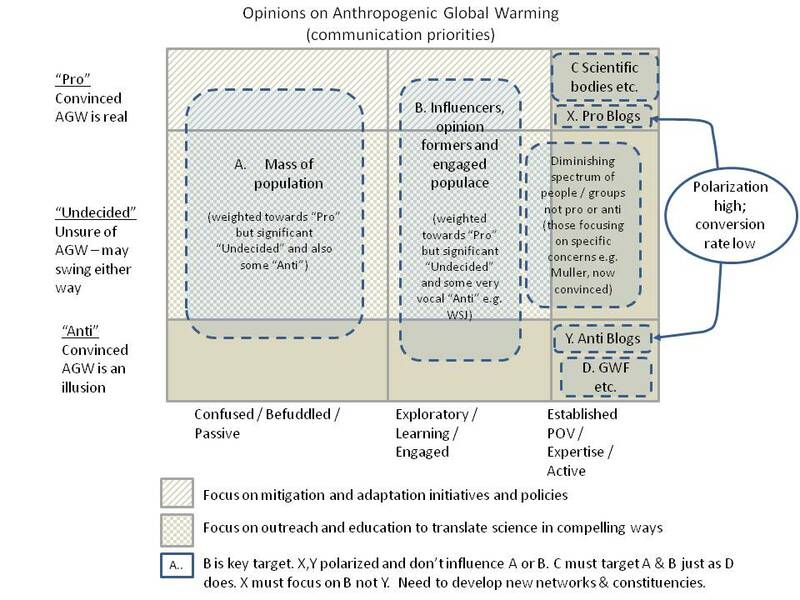 The other dimension (horizontal) represents the level of engagement with AGW, from ‘passive’ (and often confused with it), through to ‘engaged’ (and with an exploratory / learning posture), and finally, those who are ‘active’ participants in the ‘debate’, with an establish Point Of View (POV), which may be backed up with some expertise (but that in itself is sometimes a contentious point). A. The mass of population, who are it seems minded to believe in AGW, but certainly not equipped to argue the case. To a large extent they are passive and rather confused by the arguments. C. These have an established point of view (POV), and are the experts bodies including scientific societies and of course the Intergovernmental Panel on Climate Change (IPCC), which represents the overwhelming scientific accumulation of knowledge, and consensus. D. These have an established POV, and are those groups dedicated to countering the consensus, such as the Global Warming Policy Foundation (GWPF), often within a liberal economic posture. To be “undecided” as an establish POV is not an impossible position, and scientists in this category, after they did the analysis, have moved to the “Pro” position. See, for example, Professor Muller’s change of viewpoint. The problem with the blogosphere is that it has today a characteristic (partly borne of weakly moderated ‘discussion threads’) that seems to encourage an escalation in language. The ‘deniers’ versus the ‘warmists’, rapidly degenerates into personal abuse and expletives. Professor Betts feels it is not helping, and inhibits engagement of a wider audience or participation, and to recruit valuable resources who can help in communicating the science and ensuing issues. What the diagram above tries to convey is that two groups – A. the mass population and B. influencers, opinion formers and the engaged populace – are where those (with a strong POV) should be expending our energy. Those in the D category like GWPF have certainly got this message. Those in the C category have in recent years begun to do much better (despite a funding disadvantage), but need to do much more. We need those in the C and X categories to spend more time talking to each other, to develop the materials needed to engage effectively with categories A and B, rather than engage in attrition with categories D and Y. Should X category bloggers refuse to talk to Y category bloggers? Mostly, I believe yes, given the current atmosphere. But when there is a shared interest in a specific topic, there is scope for a constructive discussion (e.g. to debate the potential role of nuclear in mitigation). The Anti-Pro polarization is consuming excessive energy while, guess what, the Anti-camp is working vigorously to influence the mass population and opinion formers, to try to undermine the Pro position (although, increasingly, ineffectively judging from the polls). Focusing on the conflict between the small number of Pro and Anti bloggers (X vs Y), may provide some kind of gratification, but it fails to ensure we build a wider ‘Pro’ platform. We need a bigger community of active Pro communicators … that can better engage with both the passive and engaged populace, and use limited time and energy in smart ways. Maybe the time has come to ignore denial. which group of your diagram would half the surveyed uk public be in? Left middle (ie undecided and not engaged so majority of A). Here’s an interesting question, that I suspect may draw some wildly different answers: if 46-48% of the public think that global warming is partly natural and partly man-made and if they believe that the partly natural bit is substantial (rather than just a relatively small variation on a more dominant long-term anthropogenic trend) what do you do if a majority of professional scientists in relevant fields think that this is wrong and that it is mostly anthropogenic? No idea. If I ask a discipline … say a microbiologist … or a structural engineer … or a geologist … what their view of AGW was it would be interesting to know (from a sound survey), but if it was linked to their level of engagement and the kind of work they had done to educate themselves, then that would be much more interesting. Have they read solid but reflective and not ‘campaigning’ books like Spencer Weart’s “The Discovery of Global Warming”, Richard Alley’s “The Two-Mile Time Machine”, and so forth … or have they been following in New Scientist, national press, etc.? Given the interdisciplinary nature of climate change sciences, I think it takes a good 6-12 months of reading just to get to base camp. Who will invest that time? Would a mathematician be any better that a dentist in doing the work? It would be an interesting study to do if it was designed well. I was meaning more, what do you do about the possibility that the public is woefully mis-informed about a particular scientific topic? Do you actively try to improve their understanding and, if so, how do you go about doing so? I don’t know the answer, but it does appear that the Cardiff survey is indicating exactly this (although this isn’t a great surprise, I guess). And so whatever they believe on the anthropogenic aspect, they are certainly in the ‘precautionary principle’ side of the argument. Therefore, after a long prelude, my answer is that a open and informed discussion on all dimensions of global warming – the physical basis, mitigation and adaptation – is absolutely needed. I know that many outreach organization do a great job (e.g. COIN) but how far have they managed to reach into the wider public? There is a lack of engagement. So maybe, those talks and discussion sessions at the WI or University of the 3rd Age are a way to get out to those disengaged but often influential groups. For these we need an army and people able to facilitate these discussions in a non preachy way, in the spirit of enquiry. Because let’s face it, no one has all the answers. Preach is often the right word unfortunately. You have just read the crying about the public being “woefully misinformed” – and underneath all that there is the fantastic idea that social changes need to be based on what the experts think. The discerning public however has just been through Y2K and several health scares from CJD to Ebola. Most of the news is made of panicky appeals about terrible things that are either happening or bound to happen very soon. And we have just been told that all the advice against eating fats might as well have been wrong. Obviously a certain number of people will be ready to blindly follow wherever the latest experts lead. The rest of the public, not so much – and this not because they are misinformed on a topic, rather they are well informed on a million other similar topics. Well, 2YK was very real, due to extremely poor software design (e.g date fields using 2 bytes instead of 4). So the fact there was no bad results was down to hard work of a lot of people (myself included). It is a very poor argument to say “people cried fire, and there was no fire”, when you employ great preventative firemen. You might say ‘thanks’. You might also say thanks to the nurses risking their lives in west Africa helping to control Ebola. Shame on you for not doing so. The fact that some journalists can get hysterical (in any direction, eg. anti-vaxxers at Daily Mail), is not a reason to tar everyone with the same brush (which looking at you blog is the idea that you wish to promulgate). Science based policy is a good thing. This is not a space for silly conspiracy theories. That is my rules, in my house. In a recent study (see separate comment) 3/4 of UK public support international calls for control of greenhouse gases. Those like you saying they are crying ‘fire’ unnecessarily are < 7%. I am really not going to waste time with your anti-science, conspiracy minded attitude. Please Maurizio, find another blog to dump on. There are plenty to choose from. one needs to be careful with surveys. when a majority of people think UK should sign up to international agreements..
and the whole range of opinion in between. from the very same survey data, one could argue, a similar size large % are only fairly, or not very concerned, linking those 2 groups together to get a big %. I imagine this group would have different policy ideas than the ‘very’ concerned’ group? Thanks Barry. Yes, surveys require care, and even when, as in the Cardiff case they take care, the interpretation of the results can vary according to what ‘we’ want to see. There seem to be contradictions in what people think – which is not surprising – but what is clear is that this is moving up the political agenda, as the new agreement between the Conservatives, Labour and Liberal Democrats indicates. it may be moving up the political agenda, but is it moving up the public’s..? maybe all the party leaders believe the statement, or the cynical might think they’ve made this joint statement, to get all the green ngo’s/activists off their backs on the issue, in the run up to the general election..
UN survey showed climate change bottom, around the world amongst the public. I’d appreciate a reference to the UN study. I think Maslow’s hierarchy of needs are in any case relevant. If people are worrying about feeding or sheltering their family, will they worry about climate change? the flooding survey, summarized a number of earlier surveys.. The Department of Energy and Climate change do regular surveys, v similar findings there, with respect to the public’s understanding of climate change – ie ~ about half thinking partly man, partly natural..
which shows the binary argument comms model, do you believe in climate change, otherwise you are a sceptic/denier, rather problematic. Q21) How concerned, if at all, are you about current climate change, sometimes referred to as ‘global warming’? Q22) Thinking about the causes of climate change, which, if any, of the following best describes your opinion? While ‘all human’ and ‘all natural’ have both shown modest falls (38 to 35% and 15 to 13% respectively). Only 3-4% ‘don’t believe’ in climate change at all.